It has been some time since l wrote you last. You tell me that, since that last letter, your prayer has continued to be a struggle, a waiting in the night. You tell me of the emptiness you often feel and of the doubts that assail you at the time of prayer. You fear that your soul is altogether devoid of faith, of hope, and of love for God. You are not, dear Wilfrid, the first soul to experience such things, nor will you be the last. I am reminded of that passage in the Epistle to the Hebrews (12:3-7) wherein we learn, to our consolation, that discipline, rebuke, chastisement, and scourging are not foreign to the disconcerting pedagogy of God. Think diligently upon him that endured such opposition from sinners against himself; that you be not wearied, fainting in your minds. For you have not yet resisted unto blood, striving against sin: And you have forgotten the consolation, which speaketh to you, as unto children, saying: My son, neglect not the discipline of the Lord; neither be thou wearied whilst thou art rebuked by him. 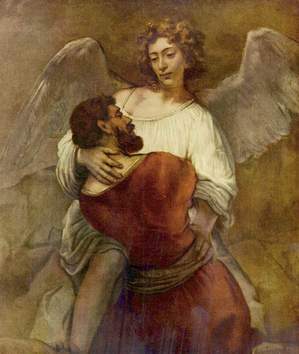 I do understand, Wilfrid, how even the Word of God can sound empty and unreal when one is sitting in darkness and in the shadow of death, not daring to believe and not daring not to believe; not risking hope and not risking not to hope; not quite clinging to love and not quite forsaking love. In such hours God's ways seem harsh and unjustified. And yet, exposing oneself in such hours to the truth of the Word of God, even when we find that truth irritating, is salutary. Yesterday, for the feast of Pope Saint Gregory VII, we sang the Introit from the Common of Supreme Pontiffs: "If thou lovest me, Simon Peter, feed My lambs; feed My sheep." While singing it, I recalled the whole scene: the risen Christ; the fallen Peter; the threefold question, "Lovest thou me? 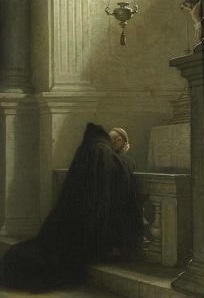 "; and the threefold confession of love, culminating in that most beautiful of prayers, "Lord, Thou knowest all things; Thou knowest that I love Thee" (Jn 22:17). 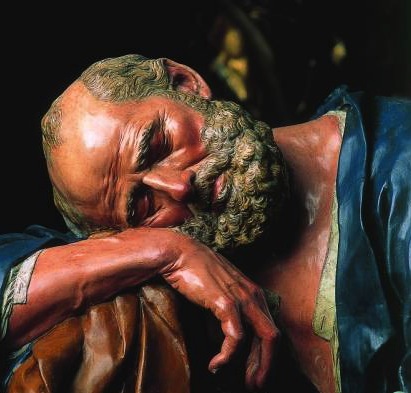 I realized then that there are seasons and hours in the spiritual life when, in spite of one's best efforts, one is unable to say to Our Lord with Saint Peter, "Thou knowest that I love Thee." There is too much self-doubt. One's prayer is inhibited by fear. In such seasons and in such hours, I propose, dear Wilfrid, that you say only the first part of Saint Peter's prayer: "Lord, thou knowest all things." Repeat it over and over, until the Lord Himself, operating in you by the Divine Comforter, the Holy Ghost, makes it possible for you to say the second half of it: "Thou knowest that I love Thee." Pray then, as you can, Wilfrid, and not as you can't. When one tries to pray as one can't, one strains too much the faculties of the soul, and so brings on oneself a kind of spiritual exhaustion. To judge by the sentiments I express in all the little poems I've made up during the last year, you might imagine that my soul was as full of consolations as it could hold; that, for me, the veil which hides the unseen scarcely existed. And all the time it isn't just a veil; it's a great wall, which reaches up to the sky and blocks out the stars! No, when I write poems about the happiness of heaven and the eternal possession of God, it strikes no chord of happiness in my own heart -- I'm simply talking about what I'm determined to believe. Sometimes, it's true, a tiny ray of light pierces through the darkness, and then, just for a moment, the ordeal is over; but immediately afterward the memory of it brings me no happiness, it seems to make the darkness thicker than ever. Say the prayer of Saint Peter as best you can, dear Wilfrid: "Lord, Thou knowest all things." 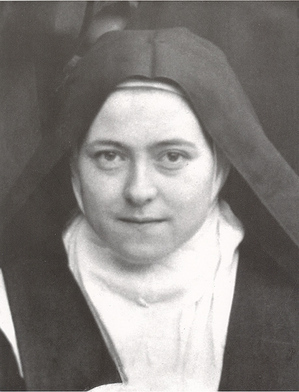 And ask Saint Thérèse of the Child Jesus and of the Holy Face to obtain for you the grace of clinging to hope until, at length, you are able to say with Saint Peter, and with her, "Thou knowest that I love Thee." First of all, thank you for being honest with me about your ongoing difficulties in quiet prayer. You are not alone in experiencing such struggles. Your worst enemy is not your apparent inability to pray; it is your discouragement. The Evil One wants to push you to the point where you begin saying to yourself things like this: "I cannot pray. I have nothing to say to God, and God has nothing to say to me. Prayer is a waste of time. I have better things to do. Why stay before the Blessed Sacrament wishing that I were somewhere else? What a waste of time! If prayer is such a struggle for me, it is a sign that God isn't interested in me. I should just give up trying to pray this way; then the struggle will be over, and I will able to move on to a more productive way of using my time." Thoughts such as these are not new, nor are they very original. Saints have wrestled with them for two thousand years. They are the common temptations of any man who gets serious about giving time to God alone. The Enemy has one objective: to get you to quit praying. The greatest obstacle to interior prayer, Wilfrid, is fear. We resist getting down to the business of prayer for fear of what God will ask of us, or do to us, should we let Him have His way with us. Know this: God will not ask of you anything that He will not equip you by his grace to do. God is exquisitely, divinely courteous. He will not force you to do anything. The inner sufferings we experience are not the effect of a divine inbreaking; they are the effect of our resistance to it. Prayer, and in particular Eucharistic adoration, is a dangerous transaction because it threatens the state of mediocrity into which one has settled. In adoration, Our Lord acts upon the soul directly. The soul, in all its poverty, nakedness, and sin, is exposed to to the searching gaze of Christ. The psalmist experienced this: "Thou hast set our iniquities before Thee; our secret sins are in the light of Thy countenance" (Psalm 89:8). I understand that you feel that quiet, interior prayer is a prolonged experience of nothing happening. In spite of what you may be feeling, or not feeling, something very real is going on. Eucharistic adoration, for example, gives Our Lord space in which to work in a soul. It is the great corrective for those of us who, by our personality and character, are in constant movement, and restless when not occupied by something tangible. From the tabernacle or from the monstrance, a small quieting voice says, "Be still, and know that I am God" (Ps 45:10). I confess, then, though I say it in my foolishness, that the Word visited me, and even very often. But although He very frequently entered into my soul, I have never at any time been sensible of the precise moment of His coming. I have felt that he was present. ... You will ask, then, how, since the ways of His access are thus incapable of being traced, I could know that He was present? But he is living and full of energy, and as soon as He has entered into me He has quickened my sleeping soul, has aroused and softened and goaded my heart, which was in a state of torpor, and hard as a stone. He has begun to pluck up and destroy, to plant and to build, to water the dry places, to illuminate the gloomy spots, to throw open those which were shut close, to inflame with warmth those which were cold, as also to strengthen its crooked paths and make its rough places smooth, so that my soul might bless the Lord, and all that is within me praise His holy Name. It is not God's way to break down the doors of one's heart. "Behold," He says, "I stand at the gate, and knock. If any man shall hear my voice, and open to me the door, I will come in to him, and will sup with him, and he with me" (Apocalypse 3:20). If you open the door to Him, He will enter quietly and humbly. He will make Himself unobtrusive, like a servant waiting in the shadows to be summoned. He wants to show you His face. He wants to reveal to you the thoughts of His Heart. He wants to converse with you as a man converses with his dearest friend, but He is also content to wait in perfect silence until you are ready for the conversation. There are souls who go through life keeping God at a distance because they fear what He might do or, rather, what they imagine He might do, should they allow Him to come close to them. Such souls do not know God as He is. If they knew Him even a little bit they would know that He is Love and that all that He does is Love. Eucharistic adoration is a remedy for the fear that keeps one at a distance from God. Why? Because in the pale round Host, so fragile, and so unimpressive, there is a poverty, a silence, a vulnerability, a powerlessness with which one can easily identify. One can focus the gaze of the soul on the Host without being blinded. One can remain in the presence of the Host without being annihilated. There is no crushing weight of glory, no terrifying theophany, no throne of judgment. There is, rather, a comforting homeliness, and a stillness that affords you all the time you need to adjust to the Mystery of the Presence. It is very painful. Sometimes God leads us to the edge of the precipice; it seems to us we are on the point of uttering hateful blasphemies. It is the devil working on the surface of the soul! Jesus Himself was given over to the devil's fury. "This is your hour and the power of darkness." From that moment the heart and soul of Jesus were the object of hell's terrible attacks. "Surely He hath borne our infirmities." Nothing purifies the soul like this inmost trial. It prepares for Divine union. Then the strength of Christ becomes the soul's only strength. You may not at all feel like you are being prepared for Divine union. I understand that. I beg you, nonethless, not to forsake prayer. You may have to wrestle until daybreak; but daybreak will come and with it the certainty that, all along, you have been in a holy place. You were trusting enough, and humble enough to share with me something of the difficulties you experience in the prayer of adoration. I pray Our Lord to enable me to respond to you humbly, and lovingly, and wisely. First of all, allow me to say that prayer--all prayer--is a real combat against the proclivities of our fallen nature. God created us to pray naturally: to pray with every breath and with every heartbeat, or, if you will, God created us to adore Him perpetually, in spirit and in truth. The original sin of our first parents was a falling away from prayer, a falling away from perpetual adoration, a break in the ceaseless heart-to-heart and face-to-face in which, and for which, God created man in His own image and likeness. With the entry of sin into the world, prayer became a struggle. The bitter irony is that, while adoration was, in the beginning, man's natural state, it became, as a result of sin, something hard to do. The advent of Christ into the world signaled a return to ceaseless prayer, the reprise of perpetual adoration in spirit and in truth. The heart and mind of the New Adam is, at every moment, waking and sleeping, lifted heavenward and turned Godward, In Him the Father is well pleased, in Him the Father takes delight, because in Him, and in those who belong to Him as members united to their Head, the Father finds again the adoration in spirit and in truth that was integral to His original design. The very first thing you might want to consider is that Christ lives forever to intercede for us; that His adoration of the Father is perfect and ceaseless; that the way of pray to which you are called is an insertion into His own prayer. It is a very humble and sober desire for union with Him in His adoration and glorification of the Father: your soul to His soul, your min to His mind, your heart to His Heart. Prayer is not so much an activity in which you engage as it is a gift that you receive from the Heart of Christ by the operation of the Holy Ghost. All of this may come across as being terribly abstract for you. Forgive me for not finding the words to say all of this more simply. I'm trying. I should like to say something about the real presence of Jesus Christ in the Most Holy Eucharist and, in particular, in the reserved Blessed Sacrament. You are not alone in feeling nothing in the presence of the Blessed Sacrament. Great saints before you have said that in the presence of the Deus absconditus, the hidden God, they felt nothing, saw nothing, heard nothing, perceived nothing at all by way of the senses. For some, the mystery of the real presence felt rather like a real absence of God. They would attempt to go to God in the Sacrament of His Love and find themselves rather like a little bird who, attempting to enter a house, flies again and again into a window glass until, at length, he falls to the ground, bruised and exhausted. For one who is trying to pray, this sort of experience becomes discouraging. Like the little bird who gives up trying to fly into the house, the soul gives up trying to pray and looks for diversion in other things. It all seems like a waste of time, an exercise in futility. What is one to do? Stop praying altogether? Be content to go through the motions of a prayer that is minimalistic? Lapse into what amounts to a practical agnosticism? I would propose two things. First of all, know that if you have the desire to pray, or even the smallest, faintest spark of a desire to pray, you are already praying, and this in spite of all your feelings to the contrary, When you go to prayer, even if you have nothing else to bring to it, bring that tiny spark of desire or, at least, a desire for that tiny spark of desire. The Holy Ghost will work with that. Secondly, take a leap of faith and say, "Even though I see nothing, hear nothing, feel nothing, and understand nothing of it, I believe that Christ is present in the tabernacle, that what I see before me is not, despite all appearances, a piece of bread; it is God's sacramental Face, that is to say, God really present and turned towards me in view of a real relationship with Him." Then say, "If you want a relationship with me, know that I want one with you, even if everything in me protests, declaring such a relationship unlikely or even impossible." This may make it possible for you to say, "Although I feel nothing, I believe that you are here for me, and I want to be here for you. I believe that your being here for me is the expression of your love for me; let my being here for you be the expression of my love for you." This will be a struggle at first. Fifteen minutes of such a prayer may feel to you like three hours. You may find yourself focused on waiting for the clock to chime. You may begin to plot ways of escaping from something that seems so unnatural, so irrational, so futile. You may even want to get up and flee. This temptation to flight from prayer can be overcome only by a flight to prayer. If you have resolved to make fifteen minutes of adoration, and are tempted to cut the time short, make sixteen minutes of adoration instead. If you have resolved to make a half-hour of adoration, and tempted to run away after twenty minutes, make forty minutes of adoration instead. This may sound harsh, but it is analogous to the struggle to complete a course of physical exercise when one's muscles are aching and one is short of breath. The exercise of prayer makes prayer a habit, and when prayer becomes a habit, it becomes easier. There are other things one can do to anchor the soul (and body) in adoration, when the temptation to flight becomes almost irresistible. I find that the repetition of very short prayers, making use of my rosary beads, is the best way to remain in prayer when I want to escape from it. You can, for example, repeat on every bead, "It is Thy Face, O Lord, that I seek; hide not Thy Face from me." Or again, "I am here for Thee because Thou art here for me." Or again, "Jesus, Jesus, Jesus, be to me a Jesus." The Holy Ghost will inspire the prayer best suited to your need in a given situation. There is more that I would want to say, dear Wilfrid, but for today this is, I think, enough. Know that I hold you in my prayer. You are not alone in your struggle. I bless you.